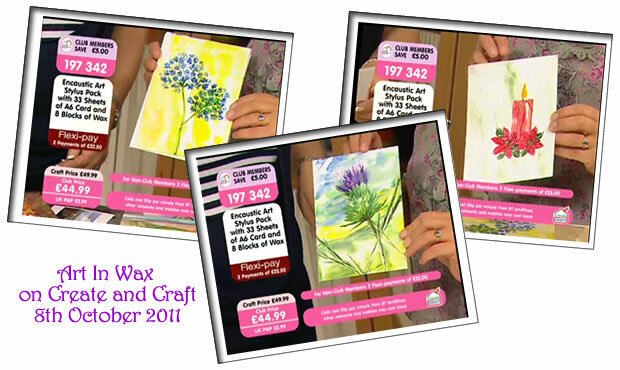 It is a very exciting day here at Art In Wax, as some of my paintings featured on TV! Today, 8th October 2011, several of my encaustic paintings were shown on the Arts and Craft TV Channel “Create and Craft” as examples of encaustic artwork. Michael Bossom of Arts Encaustic was on the channel today demonstrating techniques for painting with encaustic wax, using the encaustic iron and stylus. As part of the show, some of my paintings were shown as examples of completed encaustic art and what can be achieved with this art form. The show is one of a series being broadcast this autumn and Michael asked me after the previous show a couple of weeks ago in September, if I would loan some of my paintings to be used as examples in this weeks show. Naturally I was thrilled to be asked and happy to send my paintings to Michael to include in his demonstration show. It was very exciting to see my encaustic art featured on screen!